​The property changed hands again in 1890 when Mr Joseph Farman Sadler acquired the business and at the same time expanded into the recently vacated property next door, 2 Tivoli Buildings (now 26 Andover Road). 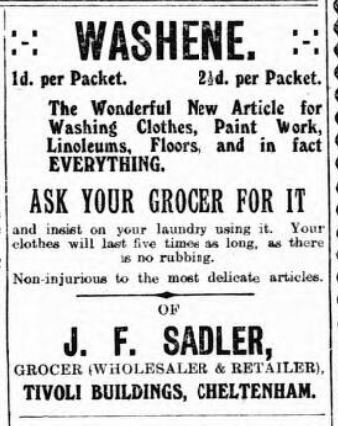 Mr Sadler, who from 1892-99 was a churchwarden at St Stephen's, remained in business here until his death in 1925 at the age of 72, during which period he had also extended the business into number 3 (28). He was an active member of the Primrose League, which was founded in 1883 to promote Conservative values.The late Jack Crook well remembered the highly polished brass name plate that adorned the whole of the shop front window ledge, polished every morning so that one could see one’s face in it and used as a ‘hair adjustment’ mirror by the young girls of the neighbourhood. ​The business then continued in the three properties under Messrs B.Wilding and Co, Grocers until some time into the 1950s when the business transferred to Silk and Son (Dobell and Bartholomew). By 1965 numbers 1 and 2 Tivoli Buildings were vacant and later number 1 was run by a Toy Dealer into the 1970s. More recently by D N Goodman located here as an Interior Design Centre and a soft furnishings showroom. 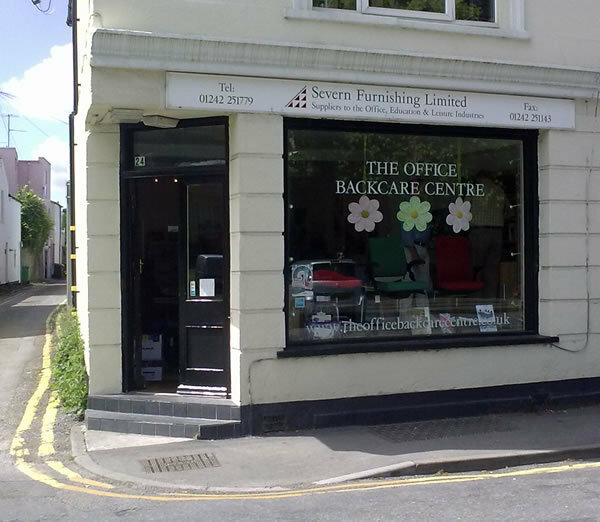 The present business – Severn Furnishing Office furniture and Specialist Seating Supplies - was opened in 2004 by Nigel Eldridge. Whilst Severn Furnishing Limited supplies furniture for general offices, boardrooms and receptions we also have a specialist office seating division to help people with back pain in the workplace. We needed a showroom to display our chairs and were delighted to secure 24 Andover Road which is just the right size and with easy parking near by. Many of our customers come from outside the area so easy access from the motorway is also a bonus. The showroom, called ‘The Office Backcare Centre’, is open 9am -1pm and 2pm – 5pm Monday to Friday and 9am – 12 noon Saturday but it’s best to phone for an appointment, particularly if travelling from a distance away. All visitors are given free postural advice and help to select the best possible chair for their needs. This sometimes takes up to 2 hours so we’ve become quite good at making tea and coffee too!